Electron cryotomography (ECT, also known as cryo-electron tomography, cryo-ET) is a 3D imaging technique that can analyze the structure of complex and varied biological assemblies in their native conditions at nanometer resolution. The sample preparation in this technique does not require separation of proteins and other macromolecular complexes from their native environment. To obtain the unique structure, tilt series of a single sample is recorded: a set of 2D images recorded at various angles. From the tilt series, 3D reconstructions of the objects are calculated, allowing unprecedented understanding of biological structures that are still located inside cells. Field emission gun (FEG): In order to attain high contrast from the frozen specimen, FEG is essential. This involves applying a high electric field to the field emission cathode, which induces electrons emission by the tunneling effect. Specimen stage: A stable specimen stage is required with high accuracy, computer control, and tilted at 60–80°. Cryo-polepiece: Tomographic data acquisition is usually a time-consuming process (takes about 30–60 min). For this purpose, a specially designed cryo-polepiece is used to decrease the contamination of ice. Energy filter: For collection of data from flagella and cilia at different acceleration voltages, an energy filter is required, which is due to the thickness of the specimen used. It is operated at zero-loss mode with a slit width of 15 eV. Digital detectors: As the sensitivity of digital detectors (such as CCD and CMOS cameras with scintillators) is higher than that of photographic films, they are used for recording micrographs. 1. Vitrification: There are two methods to embed biological samples by vitrification. Plunge freezing: In this method, specimens are frozen in a thin layer (less than 0.5 μm) of water, and are plunged into cryogens such as liquid propane or liquid ethane. A 3–5 μl drop of sample is placed on a holey carbon grid. To get the thin layer of solution, excess liquid on the grid is absorbed with a filter paper. The absorbed grid is then plunged into liquid propane or liquid ethane at liquid nitrogen temperature. This overall process of freezing occurs in a few microseconds. High-pressure freezing: In this method, bulky specimen is frozen in 200 µm and sectioned by cryo-ultramicrotomes. This is done by combining very fast temperature decrease and application of high pressure, which lowers the melting point of water. 2. Thinning: Due to the strong interaction between electron and matter, specimens thicker than 1 µm are not transparent to electrons and need thinning at cryogenic conditions. 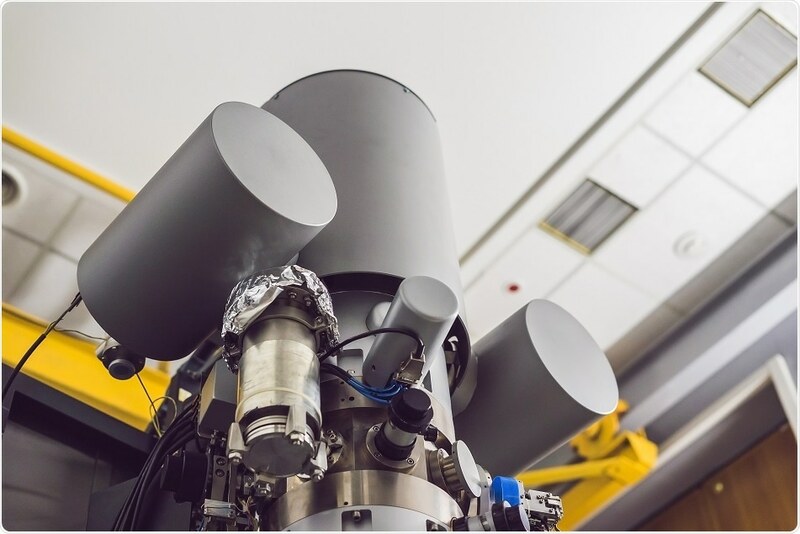 Focused ion beam milling (FIB) can be applied for this purpose, which involves cutting off the sample using the focused ion beam while it is under observation, so that recognized areas of the sample can be removed. 3. Electron tomography: 3D images are obtained by tomographic imaging. In this method, a set of electron micrographs (tilt series) are generated by tilting the sample at different angles by rotation of the specimen stable. Each tilt series is a projection through the specimen where structural information is superimposed in the direction of electron beam. Tilt series images are then arranged and computationally combined into a 3D image (tomogram), thus isolating the superimposed structures. Image restoration: This improves the quality of the tomogram. Nonlinear isotropic diffusion technique improves SNR by first detecting the structure (edges) and then smoothing of image while restoring the edges. Image segmentation: This is used to separate the feature of interest from the background. It can be achieved by manual segmentation that allows 3D visualization of the feature or slice-by-slice membrane segmentation based on previously segmented slices, local image properties, and external information. Template matching: Large molecular complexes in tomograms are identified by searching for a template representing the molecule or complex of interest. Subtomogram averaging: It is used to increase the resolution of the structure of interest, which is obtained by averaging 3D volumes extracted from the tomograms. One of the major advantages of ECT is that cells can be preserved in the absence of chemical fixatives and imaged in a near-native state. It is applied to intact cells in a fully hydrated state. It has the strength to image in three dimensions. Sample selection: Thickness of sample and its preparation have huge impact on the level of details that can be obtained in cryo-tomograms. To minimize this artifact, cryo-sectioning can be performed. Radiation damage: ECT images have low contrast because of radiation damage to the samples from electrons breaking bonds leading to destruction of biological structures. To overcome this, sub-tomogram averaging is applied. The missing wedge: ECT produces a 3D image by obtaining information from all angles by tilting the sample to 180° but it is limited to -60° to +60° in practice. This causes “missing wedge” of information in the reconstruction, an anisotropy that reduces the resolution of the tomograms in the z-direction. Identification: Identifying a structure of interest is a major challenge in ECT. Fixed snapshots: ECT records only frozen images.